Published: July 2003. Last Updated: August 2011. This chapter walks you through a technique for documenting change detected in before-and-after sets of satellite images. The technique can be used for any set of images that show the same area at the same scale at different times. 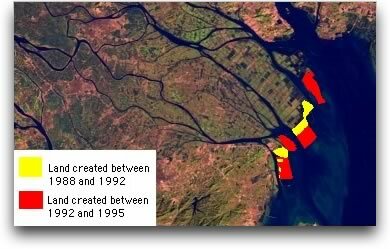 In this chapter, you will examine three Landsat images of the Pearl River delta in southeastern China. The time series images show the region in 1988, 1992, and 1995. After creating an animation stack (movie) from the three images, you can flip between them to identify areas that have changed. You will observe changes in land use over time, including yearly differences in vegetative cover and lake levels. To document one type of change in the region, you will outline new areas of land created through land reclamation projects. The final product of the chapter is an annotated image showing the new areas and the timeframes when they were created.